Who was the first person to circumnavigate the world? Most of us learned in school that it was Ferdinand Magellan. But the problem with that answer is that Magellan died during his voyage, so physically did not actually make it around the world. It was his expedition that did the feat. So who is the actual human being to have done the deed the first time? Well, many people believe it was Magellan’s slave Enrique! History is unsure if Enrique was Malay or Filipino. Both groups claim him. But he is known as “Enrique of Malacca”, or “Henry the Black”. Here is a more thorough discussion of Enrique. And he’s famous enough in parts of the world that there’s even a band named after him. But I think it’s safe to say that hes virtually unknown to mainstream Westerners. It seems that Enrique was a Muslim who was encouraged to either convert to Christianity or pretend to have done so, in order to avoid bad treatment from Magellan’s crew. As Magellan’s translator, Enrique noticed that he understood some of the words shouted at the crew from locals in boats about an approaching island, near the end of the great expedition. This told him that they were once more in the Western South Pacific. It was probably Enrique who first waded out to greet these people and make official contact. 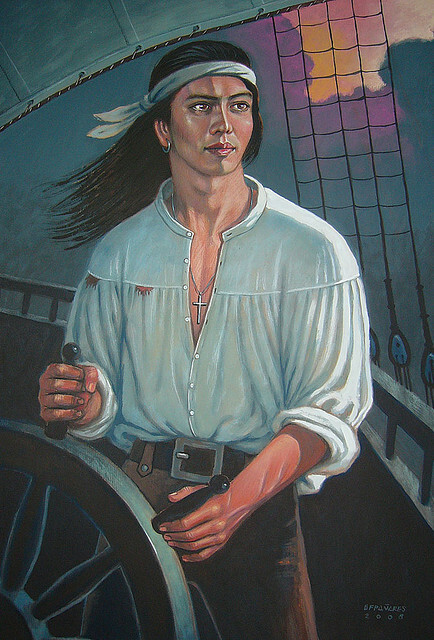 Thus, it was quite likely that the brown-skinned Malaccan slave Enrique was the first human being to have traveled all the way around the world.